Teeth replacement options are growing steadily year on year. New materials, techniques and technology are all adding to the choice available to the patient at Winning Smiles. Whether you have one tooth, a few teeth or even a whole jaw-full missing, your choice will include thoughts of comfort, budget and lasting value. Your individual circumstances will have an effect on all of these, but we at Winning Smiles are confident that for nearly everybody we have seen, there is a solution. Even if you have been told before that nothing can be done, we almost always can help. What is more, the techniques we use are almost certain to provide a way for you to walk out with replacement teeth on the day. Before any teeth replacement treatment takes place, we take patients through all of these considerations and assess their suitability for treatment first. Once we have established everything you need to know, then we will take a Digital CT scan – this is the only way to know exactly what can be done. This is worth emphasising, that without a scan, nobody can tell you, not even us – and we have thousands of cases to learn from. As we like to say, you can’t tell just by looking. We have practised pain-free dentistry since around the turn of the century. This is the first step towards making our patients as comfortable as possible. But, patients who need teeth replacement can be more nervous than anyone. It can partly be because of fear of dentistry that people have avoided us in the past, and they need more work doing as a result. Our team are very sympathetic, and we probably know as much as any of our nervous patients, as we have worked with nerves many times before. Often, it is as simple as taking the time to talk through what will happen and what to expect. A smile or two goes an awful long way. Please take a look at our dental phobia reviews to see what nervous patients have experienced. It feels great afterwards. Dentures are removable teeth (also known as ‘false teeth’). 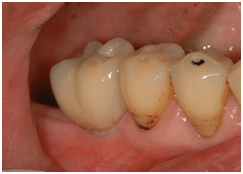 Not everyone realises that they can be used to replace single teeth as well as many teeth. Each material has its own advantages and disadvantage which you read about here. Dental bridges have been around for 100 years. Until dental implants came along dental bridges were considered the gold standard treatment for the replacement of single teeth or a number of teeth. You have sound teeth to attach to – usually either side of a gap. This is a sub-species of bridges called ‘Maryland’ or ‘Rochette’ bridge. These bridges are suitable for only a single tooth and glue onto the next door tooth. They make excellent fixed ‘temporary’ teeth but will only last a few months – especially if they are used as temporary back teeth. These bridges do not require drilling of the next door tooth as they simply glue on, however they are prone to dislodging and we only use them as temporaries. Titanium implants are now routinely used to replace missing teeth. A minor surgical procedure is undertaken to gently screw a titanium implant into the bone where a tooth is missing. We do this using local anaesthetic and it is gentler than a tooth extraction! We can provide sedation for this treatment if you wish. We offer oral sedation, free of charge. The titanium post needs to be left for a short time for the bone and gum to heal around it before it can be used to support a new tooth on top of it. Once that happens, the titanium becomes one with the bone around it and is not visible when the patient smiles. Dental implants can be used to replace one, a few or all the teeth in the mouth. If lots of teeth need to be replaced with implants then we do not put an implant in for every tooth that is missing. 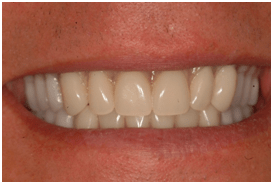 Instead, we fabricate bridges that fix onto the implants so that each implant is supporting more than one tooth. Dental implants can also be used to secure dentures in place. These are called ‘implant retained dentures’ – super dentures that can be used to present the World News without fear of them falling out, and equally at home chewing through a juicy steak!